We’d love your help. Let us know what’s wrong with this preview of Icefall by Gillian Philip. To ask other readers questions about Icefall, please sign up. Icefall – is the fourth and final novel in Gillian Philip’s brilliant Rebel Angels series. In her vivid, muscular, prose Philip concludes the tale of Seth McGregor and his clann’s struggle to save the veil that protects his world. What a series it’s been and what a dazzling finale this book proves to be. In Rebel Angels Philip has created a narrative of such complexity it has sometimes been difficult to keep track of all the wonderfully inventive plot strands and the multitude of characters. 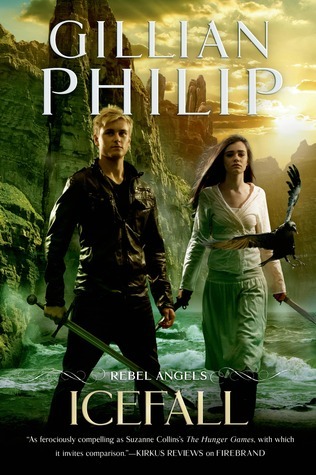 Yet Icefall – is the fourth and final novel in Gillian Philip’s brilliant Rebel Angels series. In her vivid, muscular, prose Philip concludes the tale of Seth McGregor and his clann’s struggle to save the veil that protects his world. What a series it’s been and what a dazzling finale this book proves to be. In Rebel Angels Philip has created a narrative of such complexity it has sometimes been difficult to keep track of all the wonderfully inventive plot strands and the multitude of characters. Yet that has never been a problem for me because some degree of confusion seems totally appropriate: the turbulent world of the Sithe is a chaotic place of violence and ever-changing allegiances. I’m glad to say that Icefall meets the powerful standards set by the earlier novels – and then some. Approaching it I was anxious lest the resolution, in particular, might disappoint. How could Philip, following on from the other partial resolutions that have worked so brilliantly, wrap up the series in a way that would work on all levels. I needn’t have worried, she does just that. Indeed, when everything seems lost for Seth and his friends, there is a marvellous twist that’s both unexpected and yet deeply satisfying because it feels so absolutely right. As always, with this series, even the most loved, and loveable, characters are not immune from injury, torture or death: this is a brutal world as well as one of great beauty. Seth, his lover Finn, his son, Rory, Rory's mortal half-brother, Jed, and Hannah, Conal’s daughter, are all back for this final confrontation with Queen Kate NicNiven and the dreadful, ancient child, Darkfall. We are reminded also of many favourite characters from the past (especially Conal of course) and it’s lovely to see some characters who have been there from the start, like Orach and Sionnach, blossom into fuller life in this episode. Icefall is a bravura conclusion to a wonderful series that I’d recommend to fantasy lovers of all ages, or indeed to anyone looking for an enthralling and very exciting read. Actual rating 4.5 stars. This review is spoiler free. This was a strong conclusion to what was an amazing series. It had been ages (aka years) since I read the 3rd book, so the list of who was who at the beginning of the book was a huge help. The Sithe world is so vivid and the characters so real that it was very easy to slip back into the story. I enjoy seeing the characters in the human world, but nothing compares to seeing them back in their own world beyond the veil. It's a dark, dangerous and Actual rating 4.5 stars. This review is spoiler free. The Sithe world is so vivid and the characters so real that it was very easy to slip back into the story. I enjoy seeing the characters in the human world, but nothing compares to seeing them back in their own world beyond the veil. It's a dark, dangerous and violent place with Kate in charge and I spend a lot of time on edge while I'm reading, because I know the author doesn't mind killing off key characters that the reader has come to love. The different POV's are written really well. It's easy to know whose head you are in, without having to go back and check. I really missed being inside Seth's head, though I think I can see why the author chose to do this. There were parts that were a little confusing to read and make sense of, but I found this to be the case in the previous books too. However, it just makes me work harder to understand the Sithe world and the decisions the characters make. The conclusion was perfectly executed, heartbreaking and bittersweet, just like I always knew it would be. I both loved it and hated it, but I don't mean that as a bad thing. Well that was a rollercoaster ride that had it all. Love, honour, betrayal, joy, twists, turns, heartache and triumph. It took me forever to read the first one on the series but it was brilliant. The characters were fantastic, even some of the supporting ones. Hero's, villains, hero/villains, they really were well written and really jumped off the page. A great finish to a great series although hopefully we see more stories at some stage. I recommend it to those who like YA fantasy (or fantasy Well that was a rollercoaster ride that had it all. Love, honour, betrayal, joy, twists, turns, heartache and triumph. It took me forever to read the first one on the series but it was brilliant. The characters were fantastic, even some of the supporting ones. Hero's, villains, hero/villains, they really were well written and really jumped off the page. A great finish to a great series although hopefully we see more stories at some stage. I recommend it to those who like YA fantasy (or fantasy in general really ). This is one of my all-time favorite series. It ended on a good note, but if there's ever a book 5, I'm ready!!!!!!! Fear. It’s wrapping around the house on the cliff as thickly as the mist coming off of the river below it. For Seth Macgregor, fear is the ticking clock signifying that his time is almost up because his soul is almost gone. For the other members of Seth’s complex clan, fear is something they’ve grown accustomed to and accepted as a part of everyday life. The clan is in a period of waiting, but not for long, because the fiercely malicious Kate NicNiven is determined once and for all to gain their Fear. It’s wrapping around the house on the cliff as thickly as the mist coming off of the river below it. For Seth Macgregor, fear is the ticking clock signifying that his time is almost up because his soul is almost gone. For the other members of Seth’s complex clan, fear is something they’ve grown accustomed to and accepted as a part of everyday life. The clan is in a period of waiting, but not for long, because the fiercely malicious Kate NicNiven is determined once and for all to gain their souls and take the throne. In “Icefall” the fourth and final installment in Gillian Philip’s enthralling series Rebel Angels, things are getting pretty complicated. Trapped on the other side of the veil, Seth’s clan is in a period of waiting. Homesick, worried, and unaccustomed to life in the 21st century, tensions are high within the family. As unexpected allies are formed, other friends are gone for good, and Kate’s determination to be in control regardless of the cost threatens to tear Seth’s family apart. This book takes place on both sides of the veil and paints a picture of a world so real I find myself thinking I am a character in this magical plot. As new relationships form and old ones are laid to rest, you will find yourself unable to put the book down. From mystical creatures in the sea to sword fights to the power of true love, “Icefall” is a story that will grab you from the first page. Readers will mourn the loss of beloved characters and celebrate with the introduction of new ones. As with any great book, and more so with an exceptional series, the novel left me with mixed emotions. I was at peace with the clan’s happiness, mourned for the loss of my favorite character, overjoyed for the bright, villain- free, future, but overall the only regret I had in reading this book is that I couldn’t have stayed in it longer. Philips concludes this series beautifully and leaves the reader feeling that, for all of the unexpected changes that have happened in this series, the one constant amidst the chaos is the undeniable proof that a family’s love and undying devotion will ultimately win every battle. Reviewer: Kate Proffitt is a creative writing major, who loves to read and write! Drew Holcomb and the Neighbors is her favorite band, Christina Rossetti is her favorite poet, and she drinks a lot more Diet Coke than she should. She also enjoys travelling and has spent some time in Europe! Kate is currently working on her first unpublished novel! I loved the first three books in the Rebel Angels series and Icefall is a stunning conclusion. Philips' unique blend of gritty, dark fantasy, which shows us the magic and terror of being human, never wilts, never stumbles, never disappoints. Seth's journey, which begins in Firebrand, has been long and arduous, chock full of passion, heroism, heartbreak and tenderness. This series is wonderful for adults and young adults alike, with a powerful plot, characters who fill your head and your heart, a I loved the first three books in the Rebel Angels series and Icefall is a stunning conclusion. Philips' unique blend of gritty, dark fantasy, which shows us the magic and terror of being human, never wilts, never stumbles, never disappoints. Seth's journey, which begins in Firebrand, has been long and arduous, chock full of passion, heroism, heartbreak and tenderness. This series is wonderful for adults and young adults alike, with a powerful plot, characters who fill your head and your heart, and a maturity of insight and compassion which flows through its pages like the most potent wine. When I started reading Rebel Angels I believed I was opening another young adult, paranormal fantasy about the Sithe. But this series morphs, even as you read, into so much more... urban fantasy, delivered with poetry and grace, mixed with the otherworldliness of the Scottish Sithe landscape beyond the veil and powerful insights into the human heart. The devastating, transformative power of relationships, the cold blade of sacrifice, the fraught responsibilities of parenthood, and how dreams tatter and tear in the cold wind of fate... Philips is uncompromising, deft and eloquent with every issue she touches upon. Icefall delivers on all the promise of the earlier books, giving not one but several satisfying conclusions to relationships; the endless battle to save the Veil, and with it the Sithe homeworld, from the intoxicating and dastardly Kate NicNiven; and a glimpse into a future which makes you smile even as you blubber like a child over the final pages. This is book 4 and the final installment to the Rebel Angels series. If this is the first time you’re looking at this series, don’t start here, go back to the first book and begin there. It’s an action packed raging story that spans these four books and is well paced throughout. It will be life or death, victory or defeat, and survival for their souls or oblivion. It’s a chaotic realm full of shifting times and allegiances. Be certain that injuries occur, torture delivered, and twists abound. Set This is book 4 and the final installment to the Rebel Angels series. If this is the first time you’re looking at this series, don’t start here, go back to the first book and begin there. It’s an action packed raging story that spans these four books and is well paced throughout. It will be life or death, victory or defeat, and survival for their souls or oblivion. It’s a chaotic realm full of shifting times and allegiances. Be certain that injuries occur, torture delivered, and twists abound. Seth and his friends have to make their stand, and they have to overcome. For some the journey has been arduous and torturous. I don’t want to give anything away, but this series is worth a read. I will say that some of the vastness of the plot lines and multitude of characters was overwhelming at times to the point of confusion, but it works. I even know that there are parts that are easily predicted. It’s not a perfect story, but in a way it works for these characters. They’re gritty characters who draw you in and you can feel kindred with at least one of them. It's been a while since I read "Icefall," so I don't recall a great deal of detail. It is a good conclusion to this excellent series, however, and probably the best book in the series since the first. Like the rest, it is full of tension, violent action, internal conflict, triumph, sorrow, and tragedy. The characters are well drawn, and none of the characters are purely good or evil -- except for Kate, who is more fully e-vil than I like to see in a serious novel. If you haven't read anything in It's been a while since I read "Icefall," so I don't recall a great deal of detail. It is a good conclusion to this excellent series, however, and probably the best book in the series since the first. Like the rest, it is full of tension, violent action, internal conflict, triumph, sorrow, and tragedy. The characters are well drawn, and none of the characters are purely good or evil -- except for Kate, who is more fully e-vil than I like to see in a serious novel. A Very bittersweet ending to a fantastic series that really does deserve more exposure. The writing was on the wall for a certain character, but the way in which their passing was handled was poignant and deserving. After a particularly slow first half of the book, the second part doesn't let up to the very last chapter. Friends and foes are lost, lines are crossed until the cataclysmic finish of the book. I really enjoyed this series because it was different. I liked that the author didn't slow down to repeat everything and explained the details at a breakneck pace. You really have to pay attention and have a good memory for details when reading this book or you might feel a little lost. It would probably be four or five stars if there hadn't been so many deaths of characters I'd grown to love. I mean, the deaths weren't entirely unexpected--it's war, after all--but it still hurts a little when a favorite character bites it. The head understands, but the heart holds a grudge. I think that I found the Rebel Angels books series on Amazon.com. Wherever I did I can say that I truly enjoy this series from the first book to the last! I admit that I got a little teary eye at the end of Icefall, but I highly recommend the book. What a great way to end the Rebel Angel series! I won the first book, "Firebrand" from a Goodreads giveaway and enjoyed it so much that I went out and bought the other 3 books following it. Highly recommend these for those who enjoy sci-fi, fantasy genres. Seriously though I have loved this series and this is an unputdownable finale. Loved every minute of this emotional rollercoaster. A good book. Some parts in the first half dragged. I'm not sure how I feel about the ending. But I enjoyed the whole series. As well as fantasy she writes crime: Crossing The Line and The Opposite Of Amber are published by Bloomsbury. She is one of the Erin Hunters, working on th Gillian Philip is the author of more than 20 books for adults, young adults and children, including the Rebel Angels series (Firebrand, Bloodstone, Wolfsbane and Icefall). Her debut novel, the dystopian mystery Bad Faith, was published in 2008. "Writing for a living is (a) what I always wanted to do; (b) occasionally frustrating; (c) a lot of fun – I take dictation from the characters in my head, who spend their lives telling me what’s going to happen next.